1. What can fans expect from this squad in 2015? We should expect to have a little more punch in the lineup, and hit with a little more power offensively. Really, really solid defense, veteran defense ... pitching-wise, we should have one of the best Friday night guys in the country, along with a very, very good returning bullpen. 2. What is the one thing that this year’s team does best? We played great defense last year as a team, but I would say the power in the middle of our lineup. 3. Bottom of the ninth, tied game, two outs, winning run on second … which player does this team want to step up to the plate? Sophomore catcher and reigning ACC Rookie of the Year Zack Collins. 4. If this team had one game to win, which pitcher would get the ball? Washington Nationals second-round selection and the highest MLB Draft returnee – preseason All-American left-hander Andrew Suarez. 5. Who are we most likely to see make a "SportsCenter Top 10" play on this squad? Junior outfielder Ricky Eusebio. 6. What does Omaha mean to this team? It means everything. It’s what we’re fighting for every day in practice, every time we take the field. If there’s ever a team that’s hungry to get back, it’s Miami, which has been to Omaha and the College World Series as much as anyone. If anyone is as hungry for that return, it’s got to be Miami. 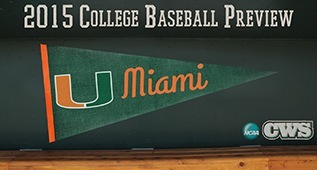 “@CanesBaseball: #BackInBlack pic.twitter.com/4ZbE8UN0oc” can I get one more year of eligibility? !